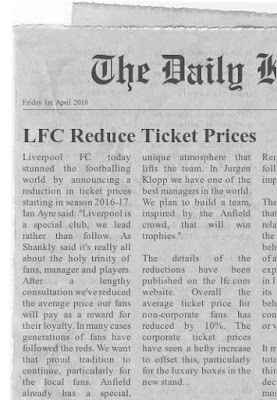 Liverpool FC today stunned the footballing world by announcing a reduction in ticket prices starting in season 2016-17. Ian Ayre said: "Liverpool is a special club, we lead rather than follow. As Shankly said it's really all about the holy trinity of fans, manager and players. 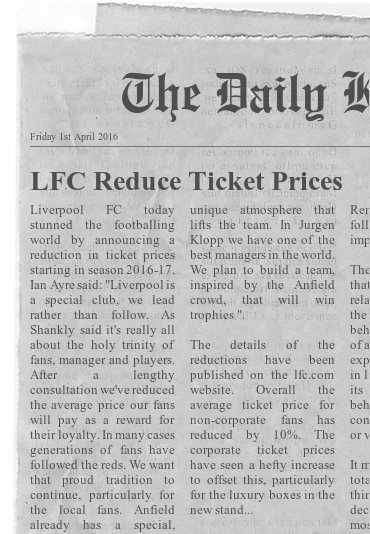 After a lengthy consultation we've reduced the average price our fans will pay as a reward for their loyalty. In many cases generations of fans have followed the reds. We want that proud tradition to continue, particularly for the local fans. Anfield already has a special, unique atmosphere that lifts the team. In Jurgen Klopp we have one of the best managers in the world. We plan to build a team, inspired by the Anfield crowd, that will win trophies ". The details of the reductions have been published on the lfc.com website. Overall the average ticket price for non-corporate fans has reduced by 10%. The corporate ticket prices have seen a hefty increase to offset this, particularly for the luxury boxes in the new stand. 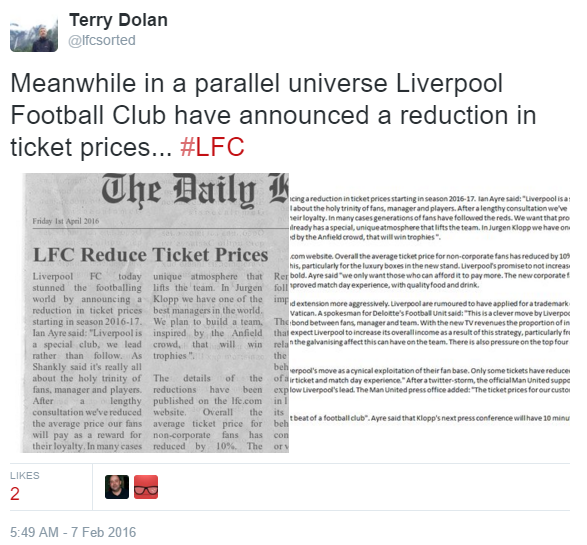 Liverpool's promise to not increase the ticket price the non-corporate fan pays for at least 3 years is bold. Ayre said "we only want those who can afford it to pay more. The new corporate facilities will be second to none". Liverpool also announced a much improved match day experience, with quality food and drink. Liverpool are now expected to market their Holy Trinity brand extension more aggressively. Liverpool are rumoured to have applied for a trademark on Holy Trinity, though this is expected to be challenged by the Vatican. A spokesman for Deloitte's Football Unit said: "This is a clever move by Liverpool. They've recognised the brand value of marketing the unique bond between fans, manager and team. With the new TV revenues the proportion of income from the normal fan's ticket expenditure is relatively small. I expect Liverpool to increase its overall income as a result of this strategy, particularly from the corporate fan and increased match day sales. Not to mention the galvanising affect this can have on the team. There is also pressure on the top four clubs [by revenue] in England to follow suit." The Man United press office issued a statement: "We see Liverpool's move as a cynical exploitation of their fan base. Only some tickets have reduced in price. Many Liverpool customers will pay much more for their ticket and match day experience." After a twitter-storm, the official Man United supporters club have already started to put pressure on their club to follow Liverpool's lead. The Man United press office added: "The ticket prices for our customers are always under review." Jurgen Klopp said "I've always believed the fans are the heart beat of a football club". Ayre said that Klopp's next press conference will have 10 minutes set aside for questions about tickets. 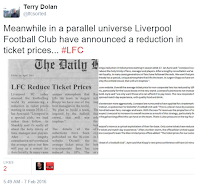 This article was originally published by @lfcsorted on twitter on 7th February 2016, a day after the 77th minute walk out at Anfield and three days before FSG announced a rethink on ticket prices. In an open letter to fans FSG apologised for 'distress caused' and announce two year general ticket revenue freeze.